The enemy was completely confused. His battered divisions were scurrying north to avoid annihilation while fresh units were brought in to try to stave off the inevitable. 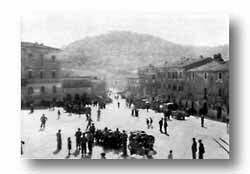 A company of bicyclists, some 200 men recently hurried from Denmark, were thrown into the line in time to meet the full weight of the 36th's assault battalion near Lake Bracciano. This unique organization was crushed before it tasted battle. For the enemy, the move had been futile -- practically all the troops were captured, along with their bicycles. 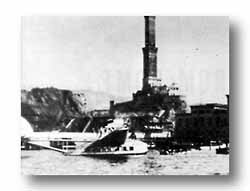 Nothing remained to hamper the progress of the 36th as it rolled twenty-five miles into the port of Civitavecchia. A command party pauses in town square of Allumiere. The 36th reached Civitavecchia, the port of Rome, on a 25-mile motorized dash from Lake Bracciano. 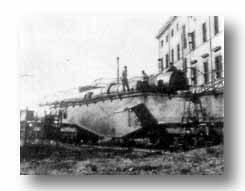 In the railroad yards at Civitavecchia American troops found "Anzio Annie," huge German railway gun that had shelled the beachhead throughout the winter.